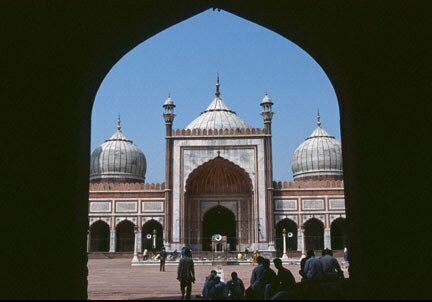 Mughal Emperor Shah Jahan’s greatest contribution to Islamic architecture may be the Taj Mahal, but the Jama Masjid in Old Delhi isn’t too shabby either. Commissioned by the ruler and completed in the 1650s it can house more than 25,000 worshippers and is India’s largest mosque. To enter one of its three gates you must first climb steep red sandstone steps, navigating a handful of snake charmers, post card sellers and trinket vendors. 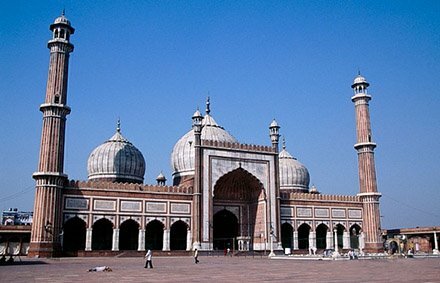 Once inside it’s easy to see how Jama Masjid’s vast courtyard can accommodate the population of a small city. On the edges of the courtyard are verandahs with gorgeous views of the Red Fort and Old Delhi. I like to stand here in the shade and listen to the sounds of the bustling markets and chaotic traffic below. Like all mosques you are required to take your shoes off before entering. A caretaker will watch them. Bring a pair of socks if you don’t like walking barefoot outdoors (the mosque has a healthy pigeon population) or if you want to protect your feet from being scorched by sun-baked marble. Appropriate dress is also required. Men should not wear shorts. Women should wear clothing that covers their shoulders and knees. Jama Masjid is open to non-Muslims seven days a week in the mornings, 8:30 a.m. (earlier in the summer) until 12:15 p.m. It reopens at 1:45 p.m. and closes 30 minutes before sunset. If you plan to take photographs be prepared to pay a fee, about 100-150 rupees. Sounds good. I can't wait to see the new airport terminal the next time I go to Delhi.